The modular Skyview Cabin is a rustic, yet sophisticated tiny cabin made out of all-natural and low-maintenance materials. Designed by Arno Schuurs and Paulien van Noort of the Netherlands-based Qoncepts Agency, the structure is clad in untreated Oregon Pine panels and features a glass wall that seamlessly connects the interior to the exterior. The construction of the wooden cabin, which is just 452 square feet, began with two prefabricated sections. The modules and additional fixtures were then transported to the building site, a beautiful meadow covered in wild flowers just outside of Apeldoorn in the Netherlands. 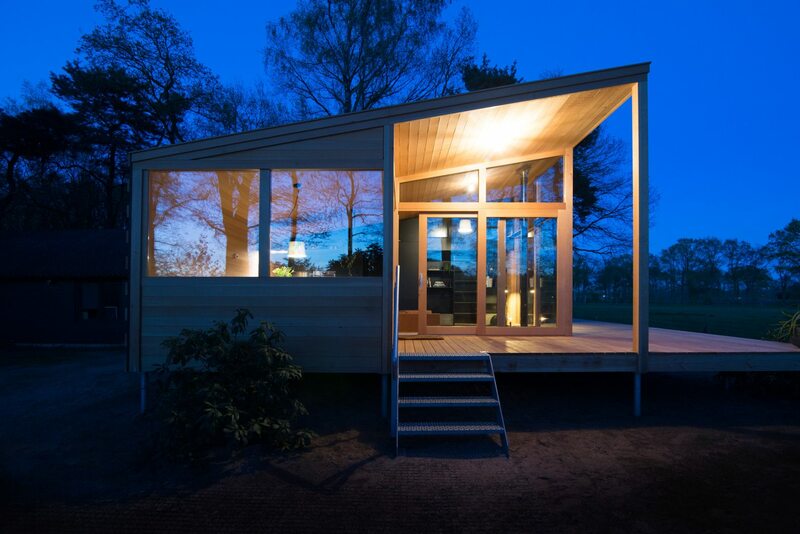 The frame of the tiny cabin is constructed from concrete and raw steel. The builders installed steel pillars with an innovative screw foundation technique that lifts the structure off the ground for minimal impact on the landscape. After the frame was constructed, the architects began to put all of the pieces together, so to speak. The construction plan focused on using all-natural materials, such as local pine planks for the exterior and oak fishbone panels for the flooring. 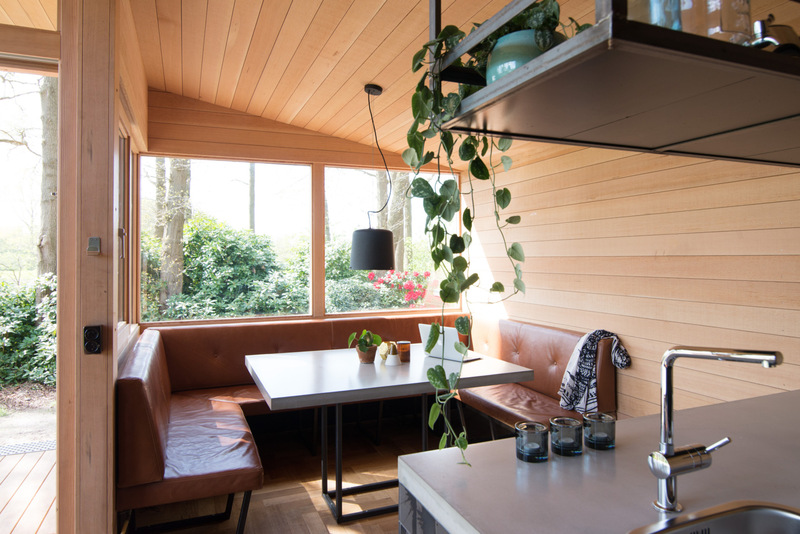 However, the main focus of the cabin was to create a strong connection to its idyllic surroundings. 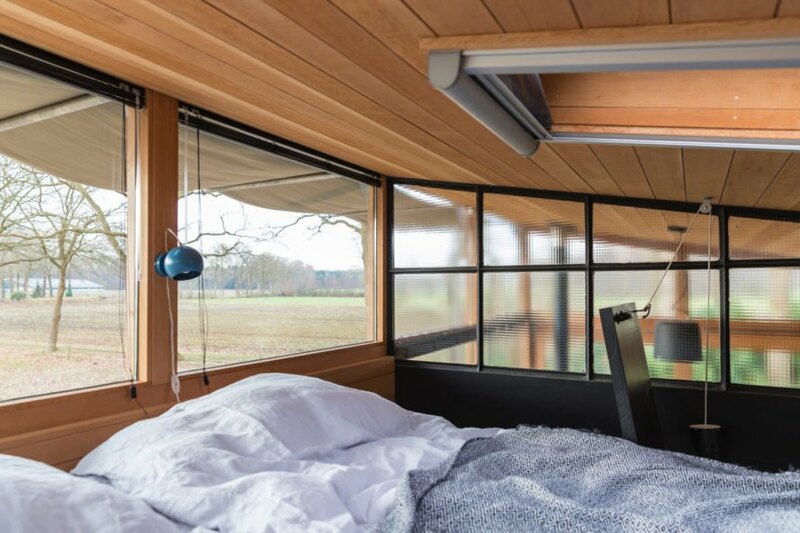 The tiny home has several large windows to let in light and provide stellar views from nearly every room. The large deck, which is partially enclosed, leads to the entrance. A large glass facade surrounds a pleasant seating area that is the heart of the home, perfect for entertaining or just sitting and enjoying a good book. Inside, the home is clad in pine and includes a compact living space and open kitchen and dining area. The sleeping loft, accessible by ladder, is referred to as the cabin’s “bird’s nest” and offers guests a king-sized bed surrounded by windows. 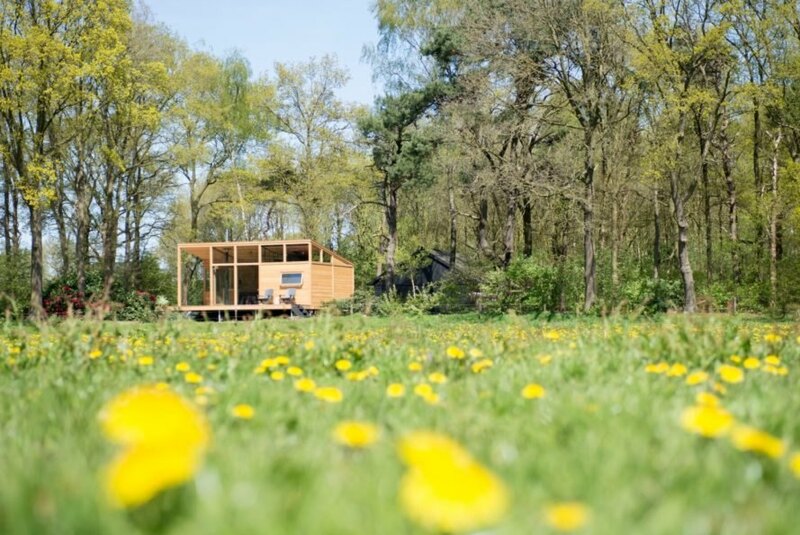 The Skyview Cabin is a prefab structure made with all-natural materials. 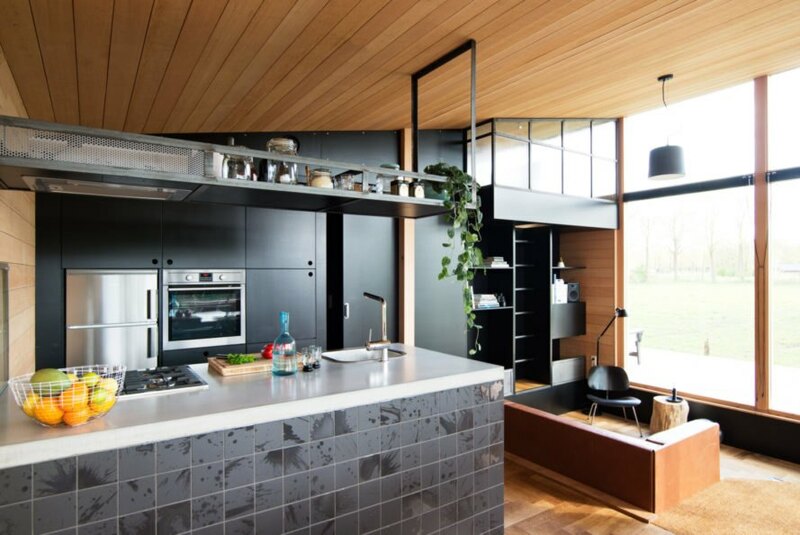 The large windows provide the home with an amazing connection to its natural surroundings. The interior of the wooden cabin lets the outside in through many windows. 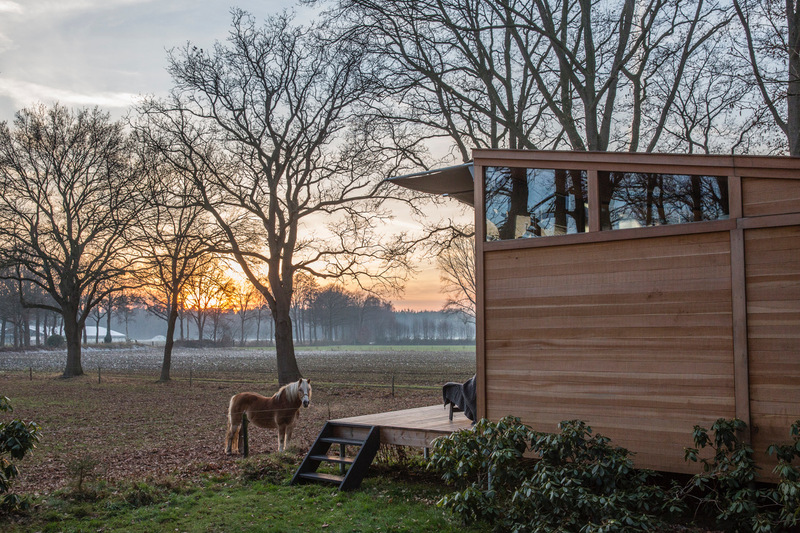 The tiny cabin is surrounded by nature. The cabin's sleeping loft features a king-sized bed. 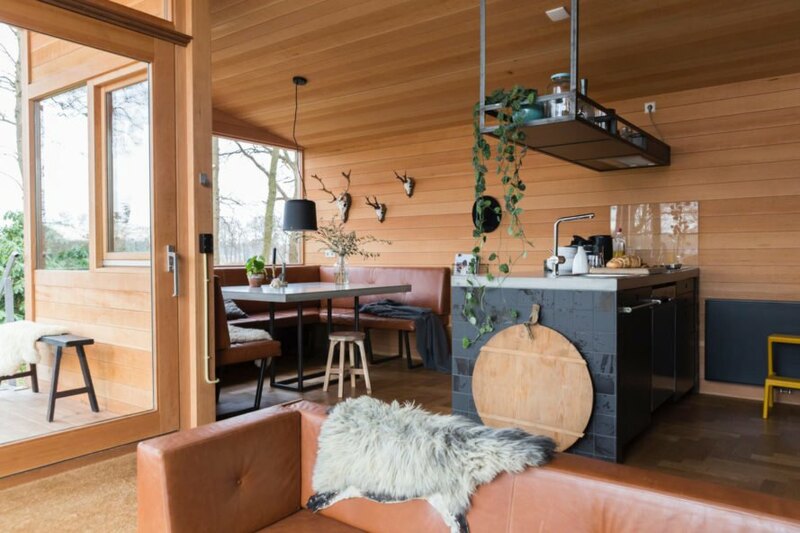 The cabin design was meant to blend the outdoors and indoors. 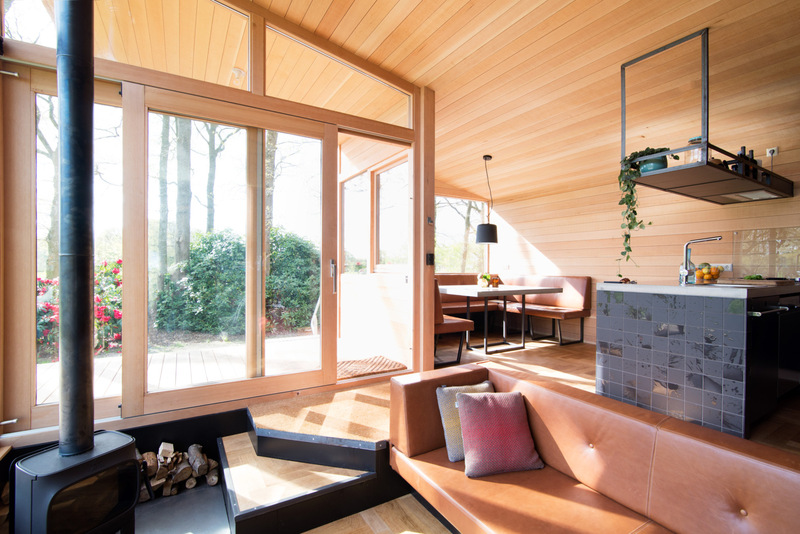 The cabin's large windows let in optimal natural light. The interior design is focused on comfort and relaxation. 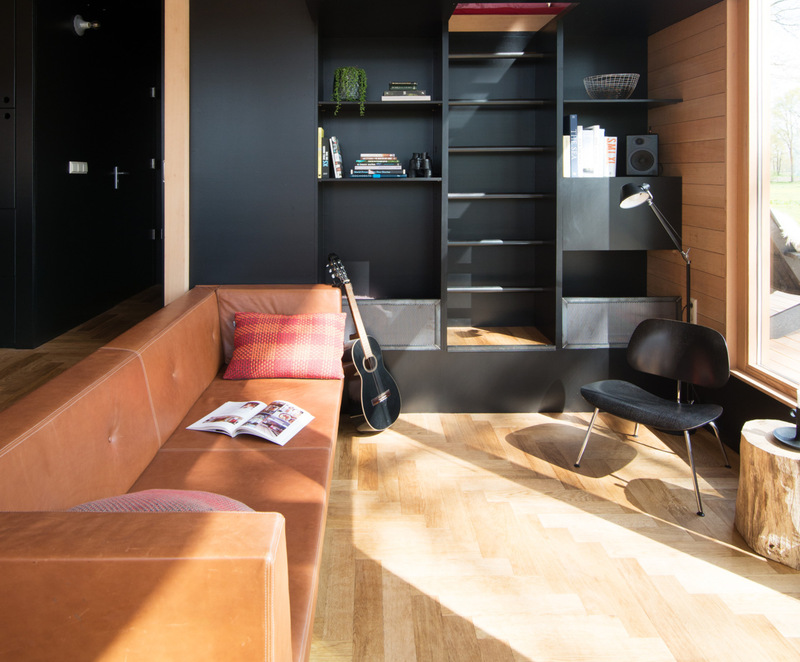 The home is a cozy place to rest or an exciting space for entertaining guests. The kitchen is the heart of the interior. The home is surrounded by stunning natural landscape.